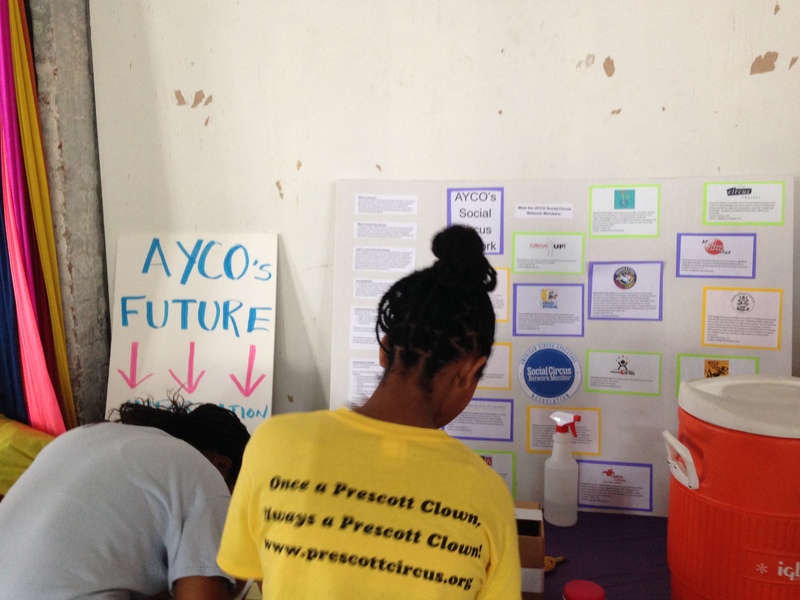 The American Youth Circus Organization’s (AYCO) recent bi-yearly festival, hosted by the Trenton Circus Squad, was a celebration of all things possible, as circus dares to do. It was also the site of a burgeoning debate on the future of a long-standing organization, and the limits and potential of growth and development if they were to merge with the organization Circus Now (CN). A community, hopeful yet divided, met with the uniting factor of a deep passion for all things circus, and for the future of our youth and our industry. We are as circus, as Americans, as people, among the most uncertain times. Sustainability of our environment, politics, health, livelihoods, and future are all deeply in question. These issues are held just beneath the surface of our public and private lives. Most of the time. Our collective struggle drives a will to provide a better future for our youth. But, wait… this is CIRCUS! Aren’t we simply talking about circus!? The topic of the merger between the two most significant American circus organizations came to the boardroom table in 2016 as AYCO searched for ways to expand its reach. Beyond its primary mission to promote the participation of youth in circus arts across the United States, it had grown to include work like the ACE Safety Program and a focus on building insurance relationships. These programs set standards and influenced the security of our country’s ongoing teaching environments. In looking to the future, executive director Amy Cohen shared the board’s assessment that it sees three significant opportunities to enhance its field: 1.) to bring circus to schools, 2.) to promote the participation of youth through social circus, bringing more resources to that sector, and 3.) to explore the question of “What’s next?”, providing pathways for youth to continue their circus journey into adulthood. Seeking to grow programs became an issue of scale, and in strategizing to grow, the AYCO board decided that its priorities were to become a bigger structure, serving both the youth culture and specifically the circus community that supports it. Thus began a research process into strategic partnerships to grow their reach. Enter Circus Now, an organization formed in 2013 to promote lifelong engagement with circus arts. Part of their mission involves advocacy and building relationships with presenters. Much time was spent assessing the potential impact of the merger. Unfortunately, news of this plan dispersed in an uneven fashion between AYCO’s stakeholders, and confusion increased as the concept was introduced to a wider audience at the 50th Anniversary Smithsonian Folklife Festival 2017. The festival, which spotlighted American Circus , was a huge mile-marker for the field and an undoubtedly prestigious event. Confusion came from many different directions. Opponents to the plan felt that the decision was already made in favor of the merge–without consulting the larger community. This seems understandable, as those who have invested great energy into AYCO’s development have a stake in its future. For some, this brought out questions of governance, and it’s to be noted that the AYCO bylaws do not require decisions be held to a vote, which left the final decision up to the board. Since the spring of 2017, three members of the CN board joined the AYCO board to work together to pursue the greater vision via the merger, and after the announcement and outcry, they invited community conversation in the form of a collective email response, published for transparency. They also held an open community meeting at AYCO’s youth festival, which I attended along with the other activities of the festival. At the core was a worry that, for either organization, messages and programs risked being diluted.The variety of opinions I received for and against the merge often differed on how one looks at building fundraising capacity. A key point of contention was clearly structural, whether collaborations between separate entities would be more successful than an actual merge, which included a 3-5 year plan to create an umbrella organization. Here is where strategy meets the unknown, with the board facing the reality of their maximum resources and capacity, and the need to either grow or scale back their efforts. Circus Now has been a volunteer organization for its entirety, and it, too, faces similar challenges in growing its work. Photo courtesy of Sarah Muehlbauer. One of the issues in envisioning the future of these organizations comes from the relative newbie status of Circus Now. On volunteer resources, the organization has focused primarily on professional development opportunities for emerging artists (including programs seen at the Chicago Contemporary Circus Arts Festival), and in building partnerships with presenters. This resulted in the first funded circus arts creation residency at Lake Placid Center for the Arts in 2017. Critics note that much of Circus Now’s work has highlighted performance on proscenium stages, which of course does not reflect the full breadth of the American circus field from traditional, to social, to all that makes contemporary approaches. CN does, however, have a significant social media reach, which is powerful to communicate to its public. This is also used to pass on circus history in an accessible, popular way. Undoubtedly we are at a time when competing for internet visibility is a necessary tool for the development of audiences and support. The goal of the merger was, as board member Shana Kennedy put it, to “include more people under a bigger tent.” In community discussion, board representatives worked to assure those concerned that under a simple merger no programs would be changed or lost. Of course, as Zoe Brookes put it, there is always a risk that future programs will not happen–this is a risk that any business faces. The core questions are… “What are we betting on for now?” and, “What are we picturing as the future?” A collective visioning process seems to be in order. Part of the AYCO Youth Advisory Board’s enthusiasm for the merge stemmed from a sense of opportunity gained or lost by having access in the USA to further education, apprenticeship, or work with American companies. Many of the youth present at the General Session spoke of their position as they approach young adulthood, facing a field with limited opportunities for circus as a legitimate career path in the States. Part of the AYCO Youth Advisory Board’s enthusiasm for the merge stemmed from a sense of opportunity gained or lost by having access in the USA to further education, apprenticeship, or work with American companies. This also inherently becomes a grey area and point of confusion as the market continues to move forward in uncertain directions. We are at a time when sustained, traditional circuses are folding, coming back, restructuring, and looking to grow in new directions. Independent companies are navigating a competitive landscape, making or breaking on their youth and determination, precarious support, and all sorts of unpaid labor. We glorify the success of those stories, while there is a deeper question it suggests,“How could we do this without killing ourselves for a cause?” The public answer often is, “Would you do this gig for free?”, so it is clear that our cultural landscape still needs nurturance to prepare for the expanding market that our youth want and deserve. How do we mend the economic poverty that surrounds us while moving forward with our art? Conversations surrounding the future programs that this merger might make possible were, from my perspective, like fish darting in all directions through murky water. What is it that youth will need to carry forward in the future? Should it be AYCO’s role to develop programs for the continuing demographic, ages 18-30? How does this differ from what is already offered by recreational circus? How much focus should be on new company development, and for what “style” of company? What breadth of aesthetic and cultural values are represented? 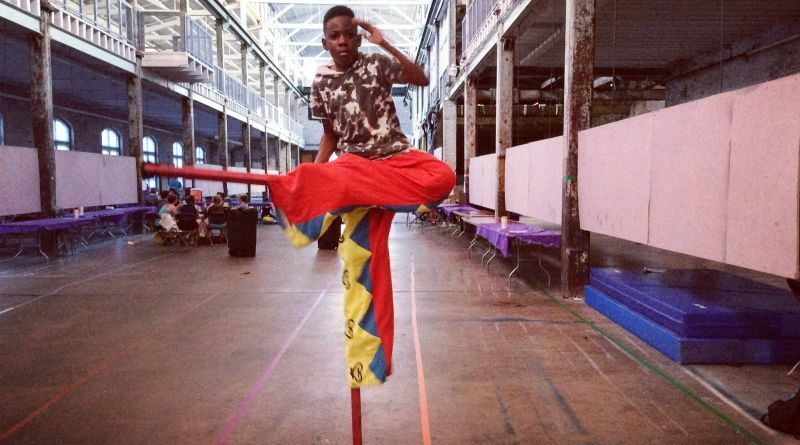 How do we connect with and revere traditional circus heritage and skill? How do we address issues of access and economic disparity? How do we create more focus on the social aspects of circus? How do we get youth more experienced in leadership, performance, and coaching roles? How can we pull in new audiences? How can we create sustainable touring models for new and existing companies to thrive? How can we change our culture? With much less posturing than the adults, they expressed the incredible value of the American Youth Circus Organization’s work, and their hopes and commitment to the future of the youth that will come after them. How could we not humble ourselves and dream with them? At a point near the conclusion of the community meeting, Shana Kennedy asked the room, “What are the other options?” putting forth a call for leadership on alternatives to what the board presented. With minutes closing down and tensions still high, the room was conspicuously withholding. Moderator Beth Filla turned the discussion toward the youth in the room. With much less posturing than the adults, they expressed the incredible value of the American Youth Circus Organization’s work, and their hopes and commitment to the future of the youth that will come after them. How could we not humble ourselves and dream with them? There is a mirror held from center spotlight, pointing the responsibility back to the ring. In essence, all questions remain on the table, and the answers start and end with the American circus community. How will each of us ensure greater potential for the future of US circus? This is the grey space to be defined, the work we will do together. It is the continual expression of our collective hope, skill, connection and opportunity. Feature photo of Darnelle Bolton courtesy of Sarah Muelhbauer. Sarah Muehlbauer is a performing circus artist, visual artist, and freelance writer, with an MFA from Tyler School of Art. She performs and produces as LLC and non-profit hybrid “Lion or Fox” and regularly collaborates with artists and companies nationally and internationally. Visit lionorfox.com for more info.